Sooo, I told you that I’m finally at a point in my life where I like cheesecake. Scratch that… LOVE it. I think that’s probably pretty obvious now considering this is my second cheesecake-style recipe in just two weeks. The thing is, I’ve always liked cream cheese. But only on my bagels and not in my cake. There’s a difference. But now I like it in my cake, in my dessert bars, and in my truffles. And probably other places, too, if I had the chance to try them. Be my guest and challenge me. When Bruegger’s Bagels reached out to me to create a recipe with one of their limited edition summer menu items, I obviously chose the cream cheese. 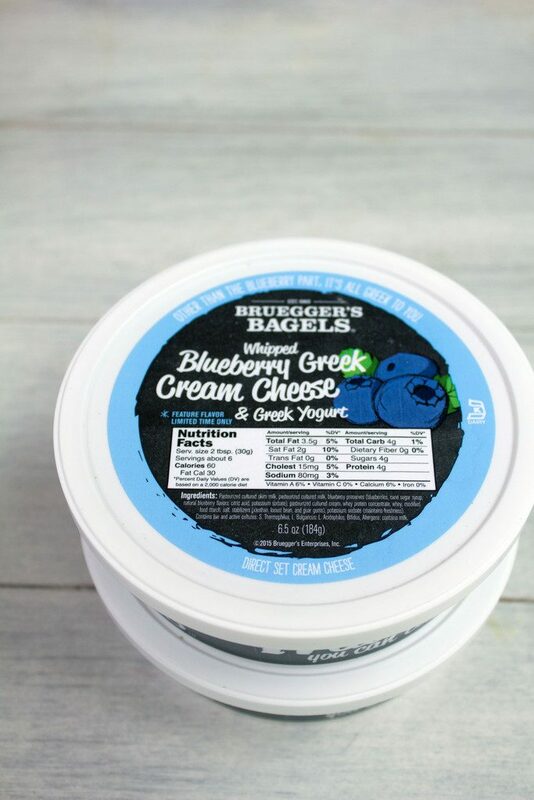 Not only because I highly enjoy cream cheese, but because this is not just regular old cream cheese… It’s Whipped Blueberry Greek Cream Cheese & Greek Yogurt. I’m a sucker for anything with blueberries. Plus, because this cream cheese has Greek yogurt in it, it has four times the protein and 50% less fat than regular cream cheese. 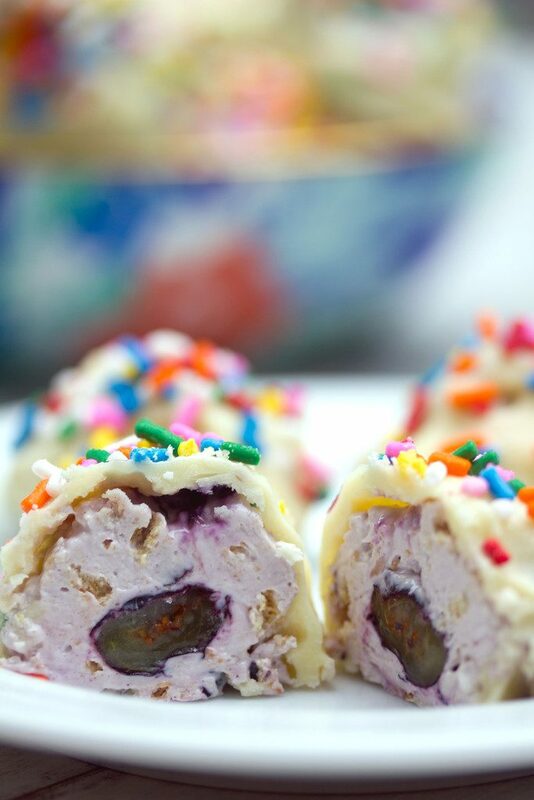 Well, until you mix it with graham crackers and cover it in white chocolate and transform it into cheesecake truffles. But those are just little details. I love the color of the cream cheese because it’s a pale blue/purple just like blueberries. No artificial colors here! Since the cream cheese is so delicious, I didn’t want to majorly alter the flavor in my recipe, so I kept it pretty simple. I mixed the cream cheese with some fresh blueberries, graham cracker crumbs, and a tiny bit of sugar. I rolled little cream cheese balls, chilled them for a bit and then covered them in melted white chocolate. And as per usual, topped them with sprinkles. There’s not a whole lot I wouldn’t top with sprinkles. Also, just a note that you definitely want to chill these in the freezer. 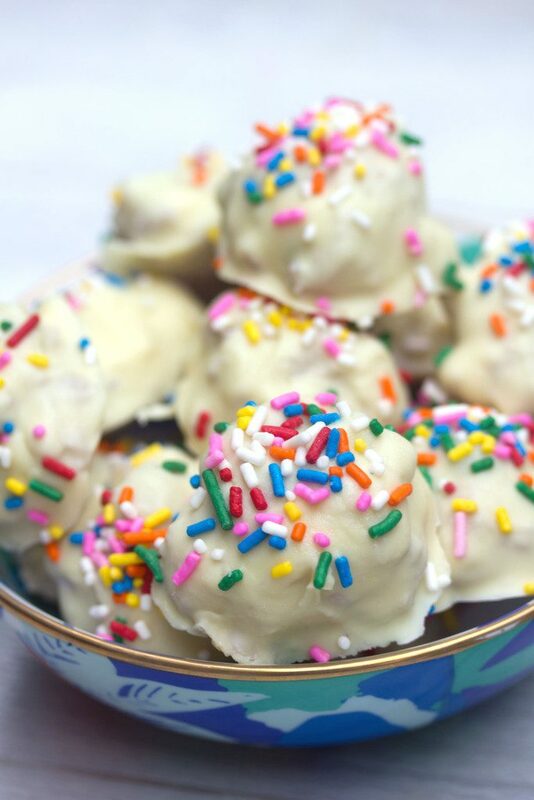 The first time I attempted these cheesecake truffles, I just popped them in the fridge for a bit and they were a disaster when I tried to dip them in the white chocolate. Every time I make truffles, I’m like “why the heck don’t I make these more? ?” They’re pretty easy and there’s SO many ways you can make them. And they’re a really good dessert option that allows you to have a little something sweet without going too overboard. Uhhh, how many calories are in sprinkles, again? Don’t answer that… I really don’t want to know. I’m so glad I kept these cheesecake truffles simple because they were packed with blueberry flavor with lots of white chocolate sweetness. If you’re not a white chocolate fan, you could try dark chocolate and I’m sure that would be absolutely delicious, too. 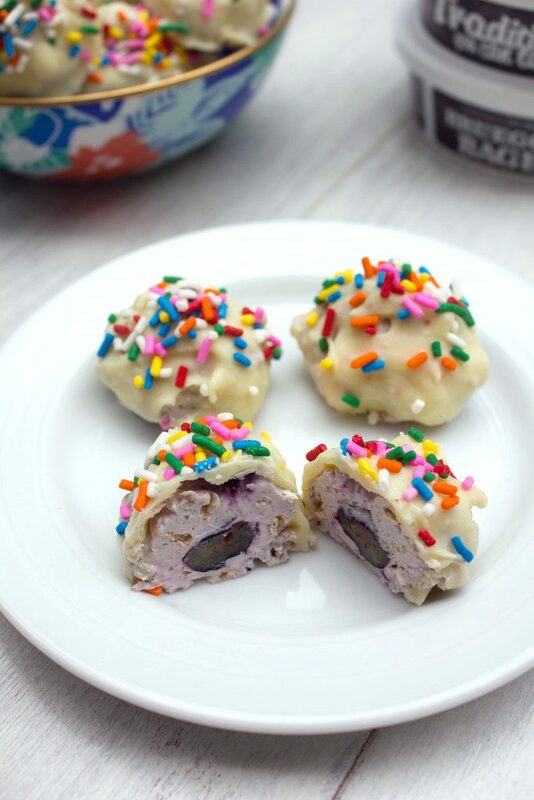 There’s a little bit of tartness to the cheesecake truffles thanks to the Greek yogurt in the cream cheese. I love that. A few years ago, I was obsessed with Greek yogurt cream cheese and I’m kind of surprised it didn’t take off more. So, I’m thrilled to see places like Bruegger’s incorporating it into their traditional cream cheeses. Also, whenever I talk about Bruegger’s I have to remember the time my sister worked as a baker there when she was in high school. She used to come home completely covered in flour. But how cool is it that she got to make the bagels?? I feel like it’s imperative that everyone has a couple working experiences that make for really good conversation. Mine is definitely my stint working for the state government in a reallyyy interesting department. Being a food blogger as part of my job now is also pretty fun to talk about. But maybe that’s just because I could be happy talking about food non-stop for the rest of my life. I mean, I can think of so many more things that should be said about cream cheese. And truffles?? Let’s spend the next 9053 hours discussing all of the truffle flavors and varieties we want to create. And let’s discuss rainbow sprinkles and how finding the mix without the brown sprinkles is essential when you just want the bright rainbow look. And then let’s get in the kitchen and make these cheesecake truffles together while we talk about how to bake the perfect cheesecake without any cracks. I feel like you guys are probably the same or else you wouldn’t be here. Right?? Right?? Oh, and one of the main reasons I miss being a freelancer is because when I freelanced, I spent hours upon hours working from the Bruegger’s Bagels in my old neighborhood. I ate a lot of bagels and drank a lot of coffee. And eavesdropped on a whole lot of interesting (and weird) conversations. If you have a Bruegger’s near you, be sure to go and check out their limited-edition summer menu items before the season is over! Though I have to admit, I’m pretty excited to see what they’re planning for fall! Are you a fan of Bruegger’s Bagels? What’s your favorite cream cheese flavor? 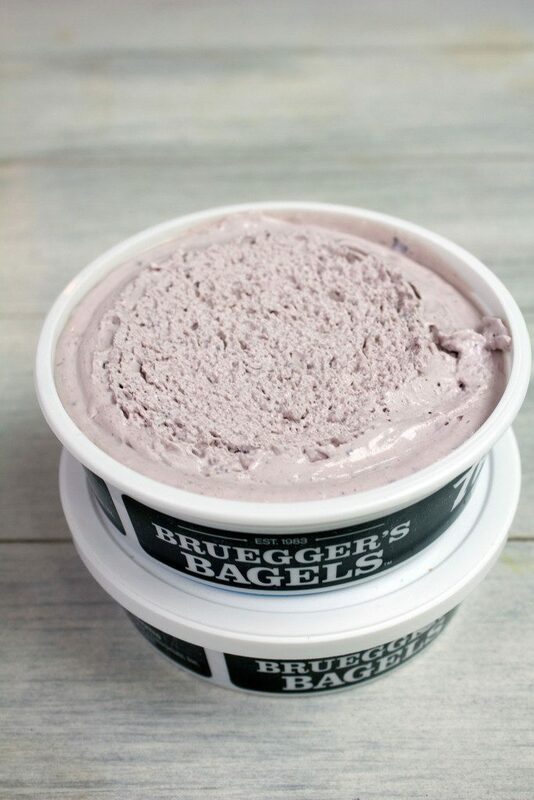 You could put blueberry cream cheese on a bagel. Or you could turn it into truffles dunked in white chocolate and topped with sprinkles. You decide. 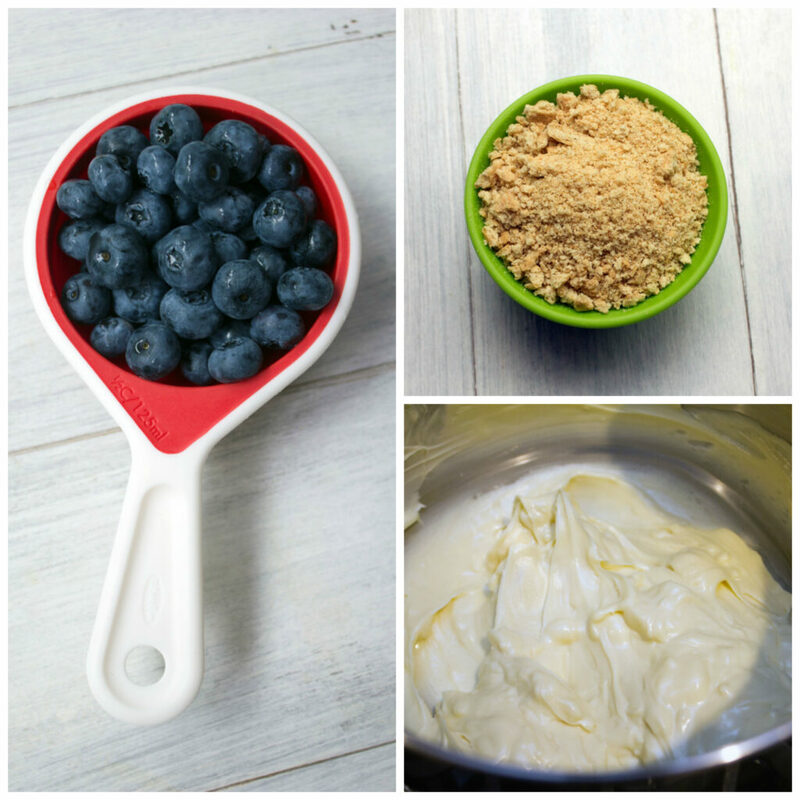 Place cream cheese, sugar, blueberries, and graham cracker crumbs in the large bowl of a stand mixer (or in a large bowl with a hand mixer) and blend until combined. Roll tablespoon-sized balls of cream cheese mixture and place on a parchment paper-lined baking sheet. Place baking sheet in freezer for at least 30 minutes. Before removing baking sheet from freezer, melt white chocolate. You can either melt in the microwave or by placing chocolate in a heat-proof bowl set over a pot of simmering water and stirring chocolate until melted (preferred method). If chocolate is too thick, stir in 1 teaspoon canola oil at a time to thin out. 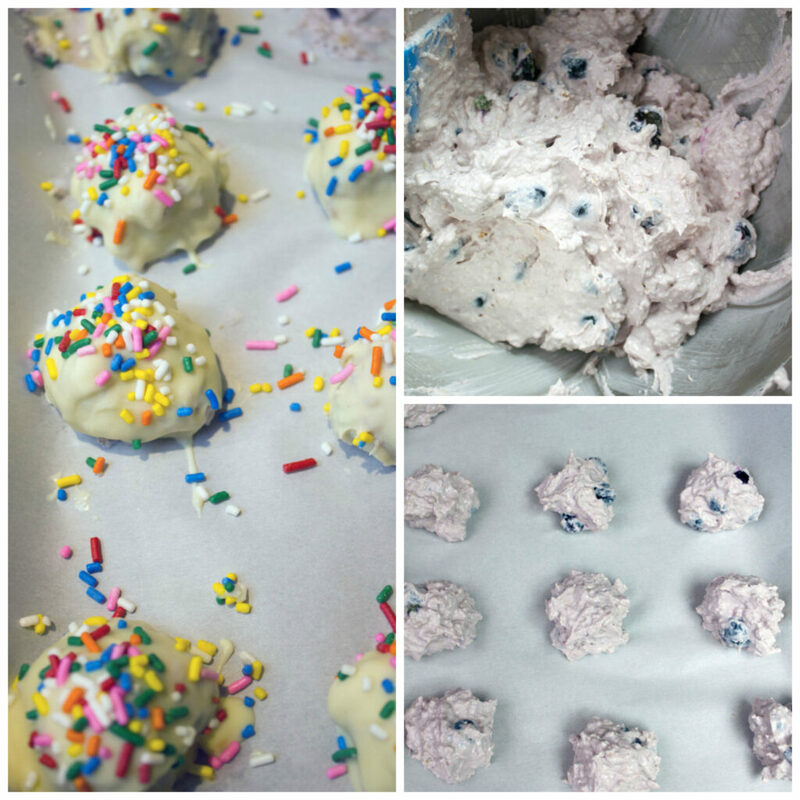 Dunk chilled cream cheese balls in white chocolate to fully coat. Remove from chocolate and place back on parchment paper. Top with sprinkles. You may need to re-warm chocolate in the double broiler or microwave about mid-way through truffle dipping. 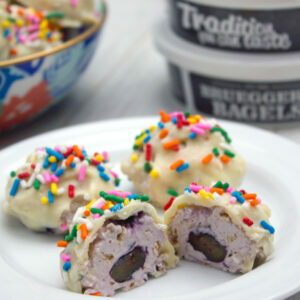 Store cream cheese truffles in an airtight container in fridge. Thank you to Bruegger’s Bagels for sponsoring this post… As always, all opinions are 100% my own! 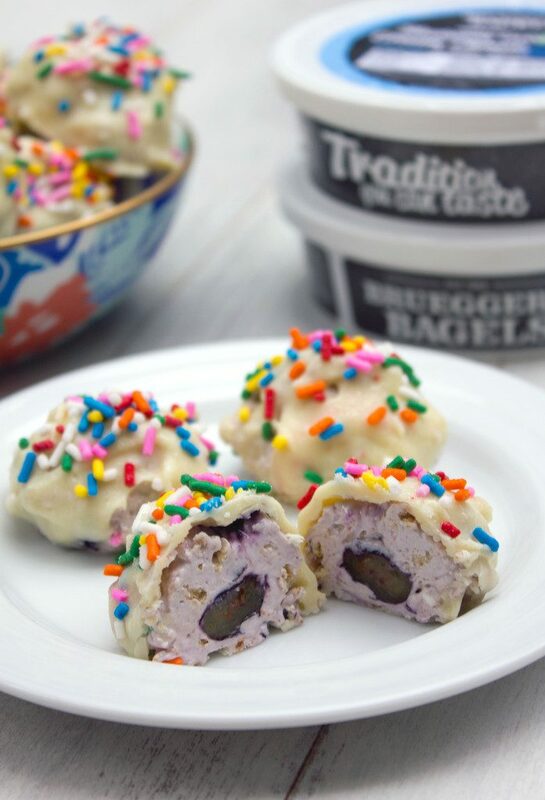 11 Responses to "Blueberry Greek Cheesecake Truffles"
Bruegger’s Bagels have always been my favorite..someone I work with brings them in every Monday..Sues, these truffles look amazing.. I can’t wait to try this new cream cheese! ? This is amazing! I’m thinking about making these in advance for my sister’s birthday party! 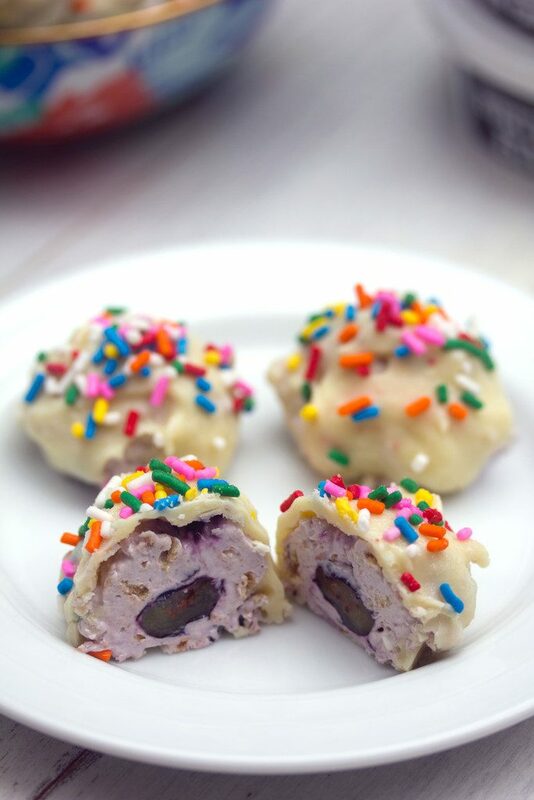 These cheesecake truffles look amazing!! I can’t believe there was a time you didn’t like cheesecakes! These are so fun! I can’t help but order their Bacon & Scallion Cream Cheese! I miss my coffee membership for all you can drink hot or iced! So worth it if you are near one! This is so awesome! I had never heard of Greek yogurt cream cheese before reading this post…but it sounds like something that would make all my dreams come true ?. I need to get in on that action! These truffles look boss. Yes please! 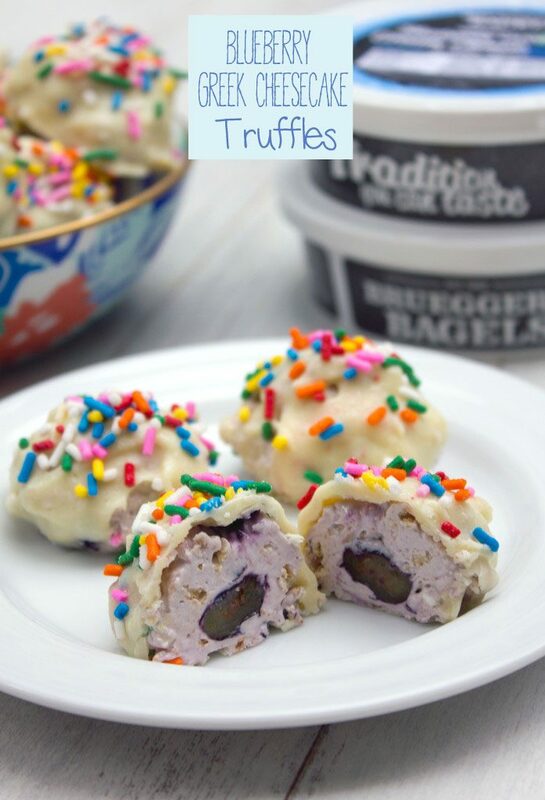 These truffles are right up my alley. Oh Sues…these look so good…I love the idea of using Greek yogurt.